RNZ reports the chair of the Melanesian Spearhead Group, the Solomon Islands prime minister Manasseh Sogavare, today starts a tour of the member states' capitals. This comes after last year's repeated failures to hold a summit with the other leaders of the MSG which has been split over how to position itself on the West Papua issue. Last month, some MSG foreign ministers met in Port Vila to consider membership criteria but Fiji's Frank Bainimarama was absent. Solomon Islands and Vanuatu have been open to accommodating West Papua as a full member while Fiji and Papua New Guinea are opposed to it. West Papua is a Melanesian part of Indonesia which, as an associate MSG member, wants to prevent the United Liberation Movement for West Papua from ever becoming a full member. Mr Sogavare is due in Port Vila today to meet his Vanuatu counterpart Charlot Salwai as well as the spokesperson for New Caledonia's FLNKS movement Victor Tutugoro. His tour will also take him to Suva and Port Moresby. 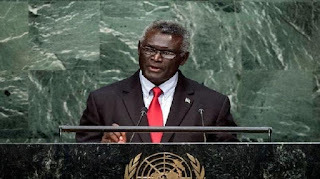 Photo: UN (Solomon Islands Prime Minister, Manasseh Sogavare, speaking at the UN).